Hope you all have had a good week. The weather here has been lovely. Spring may just be creeping in on us. But, before we break out the potting soil and flowers, let's take a look at our last ski trip. The boys. Love these chairs made of skis. Lainey enjoyed some music in the lodge. That lady to the left doesn't look as amused as we are with the situation. My boys. I'm sad ski season is coming to an end. These are fun days. So grateful our first year out of Colorado was a good one. One last chance to catch snowflakes. Live it up, Laine. So, yesterday, we had temperatures in the 40's (!!!!) and I do believe we might have hit 50's at some point, too. We ventured out to the zoo, of course. Lainey is party pickin' with the Buddha. Wearing Tessie Mayes' hand-me-down chocolate Pumas. Looking good. "Mommy, why won't you let me breast feed on our hike?!!! I'm hungry!!! I know I am too old but you still carry me and Lainey around in a Baby Bjorn and we are way too old. Just a little suckle please?" Coco seems to think that by age 1, mothers should stop carrying their children around in these contraptions. Lame. We've got a busy weekend ahead. I'm working both days. Carter has 2 birthday parties. Blake will be up to his elbows in trains and baby dolls. Hoping for more good weather and some time outside in between commitments. Are yall watching The Oscars? Lots of controversy this year. Check out this link for more deets on that. Blake and I rented The Hurt Locker last weekend. I thought it was really good and Jeremy Renner was fantastic. And, since I was one of 3 people left in the United States who did not see Avatar, I can't comment on it. I did see Inglourious Basterds and thought it was really good. Missed Precious. Need to see that. Enjoyed The Blind Side. Loved Up. Want to see A Serious Man. Up In The Air was fabulous. So far, no one has called me for my opinion, though. The humanity! Party pickin' with Buddha. Ahahahaha. That pic of Jack would be cute framed. Blind Side.. I want to see Precious too but Brad refuses. Haven't seen Avatar either but Brad says it rocks. There is something wrong about the fact that Lainey's clothes are cuter than mine. Go girl. Blake is such a good dad. I didn't see Avatar either. Not really in to that type stuff. The only one I saw was Blind Side. I really want to see Precious. That picture of Lainey catching snowflakes is precious. Happy weekend to you and your fam Casey! 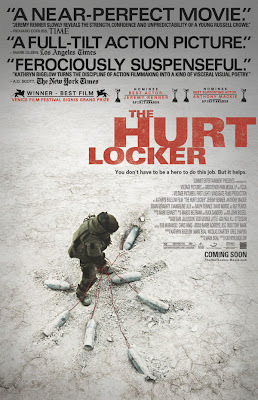 We loved The Hurt Locker! Found your great blog through Friday Follow. Now following! At Tech we had this guy named Mike, who worked for Party Time (photography place. He came to all of our mixers and parties. We'd get over served and just shout out "Party Time" and he'd come and snap our picture :) I want to teach Corinne to yell that when she sees my camera! There'd be a lot of Party Time yelling around here! I will miss your snow baby pictures but am so ready for spring now! We are going to hit 70 today and it feels so nice! Have a good weekend. I didn't see Avatar either. My husband saw it 2 or 3. I loved The Blind Side and haven't seen any other movies. Wish I could see as many as you do! I'm beginning to worry about Casey blog commenters and their lack of movie viewing. I proclaim myself a non-movie fan but have seen almost every movie mentioned. Why the lack of movie going, especially if you really want to see something? I am one of the three who have not seen Avatar. I love the picture of Lainey catching snowflakes and party pickin with Budda! Have a great weekend! Following you from Friday Follow, hope you can come by later. Have a great weekend. Good Afternoon! Happy Friday Follow! I am your newest follower. I LOVE the colors of your blog! Good choice :) Come visit me :) and have a great weekend! Shoot me an email if you'd like me to subscribe, twitter or facebook. Great photos. I do see some similarities in Jack and the monkey. I like party pic with budda too. I want to watch the Oscars but I have only seen Up in the Air. I am too busy for movies. When do you people find the time? I don't even know when I would squeeze in a movie. I am happy to hear the reviews. I think the people yelling controversy are just whiners. Great photos as the snow (finally) leaves the scene...I'm glad to have found your blog. I'm visiting and following from FF and hope you'll do the same. I'm looking forward to reading more. Have a great weekend. The closest I came to Avatar was some blue guy in the McDonalds happy meal!! I guess that makes me one of the three. So I thought I was on top of my reading (at least) but I guess not...what job are you working?? My son's only goal at Disney World last summer: Meet Mr. Fredricksen. It's like they were kindred souls. OMG. Lainey & that Buddha!!! Cracking up. Only movie I've seen on the list is The Blind Side. I liked it, but I don't know that it's Best Picture worthy. cracking up at Jack and the monkey. Did you spike his hair??? Glad y'all had some warm weather for the zoo! UP!! Best. picture. of. the. year! i don't know about avatar... i just couldn't bring myself to see it... ?? am i crazy?? i put precious on my netflix list and can't wait!! bye bye snow, hello corn, potatoes, and mudbugs. Hello from a late friday follower! Sara - Yes, Jack's hair is spiked up. "Yike Carter's", of course. Looks like another fabulous weekend! I saw Up in the Air and it just didn't do it for me. Working on The Blind Side this weekend. Love Sandra Bullock.